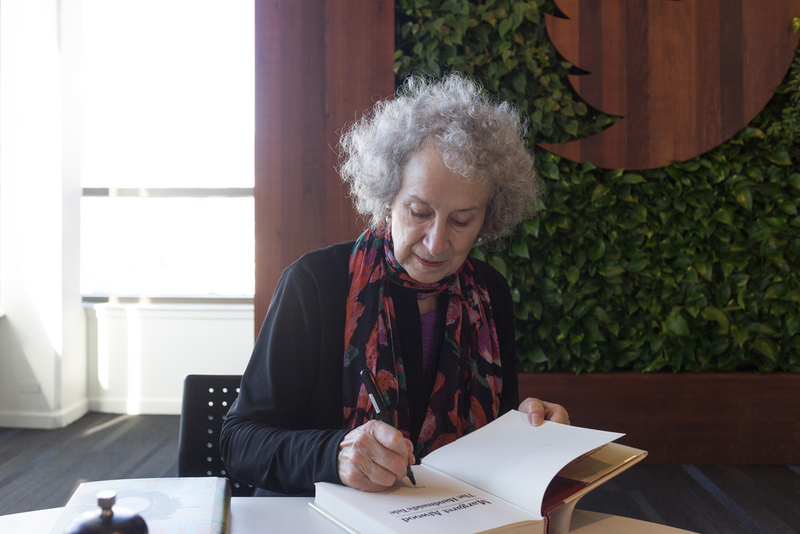 The signatories include author Margaret Atwood, musician Raffi, and filmmaker Paul Haggis. “This bill was rammed through Parliament by the Harper Conservative government, despite a huge public outcry and without due consultation,” the letter states. “As many experts have pointed out, this bill allows the government to silence dissenting voices without oversight or accountability. It criminalizes ‘advocating or promoting the commission of terrorism offences in general,’ which, because of this vague wording, could be interpreted in some very stupid ways. In effect, it gives the government carte blanche to suppress any voice they don’t like,” the authors write in their letter. write a spy novel about an assassination plot? record a song questioning our government’s agenda? paint a mural about the conflict in Syria? produce a documentary on security threats in Canada? put on an art show critical of the oil sands? make a film with an environmental theme? We are Canadian artists. We have been blessed to be part of a country that does not send poets to gulags, that does not behead people for saying things a government considers critical of it, and that does not murder dissidents and journalists wholesale. But we know that totalitarian and repressive regimes always try to shut down artists, along with any other independent voices. We are alert to the possibilities: we, and all who wish a free and open society, must strongly oppose such tendencies when they arise. Bill C-51 directly attacks the creative arts and free expression in this country. This bill was rammed through Parliament by the Harper Conservative government, despite a huge public outcry and without due consultation. As many experts have pointed out, this bill allows the government to silence dissenting voices without oversight or accountability. It criminalizes “advocating or promoting the commission of terrorism offences in general,” which, because of this vague wording, could be interpreted in some very stupid ways. In effect, it gives the government carte blanche to suppress any voice they don’t like. – write a spy novel about an assassination plot? – record a song questioning our government’s agenda? – paint a mural about the conflict in Syria? – produce a documentary on security threats in Canada? – put on an art show critical of the oil sands? – make a film with an environmental theme? Creativity, expression, opinion, and art are not the same as terrorist propaganda. Through its “chill” effect, C-51 undermines one of the chief freedoms of a democratic society: the right of every Canadian to free speech and free expression, including free artistic expression. In addition, Bill C-51, because of the lack of oversight and accountability, is an invitation to intellectual property theft. All creative classes, including entrepreneurs and digital creators, are threatened by it. And every citizen is subject to blackmail, due to unlimited, unaccountable access to personal information. We agree with the more than 300,000 Canadians who have called on the government to scrap this reckless, dangerous and ineffective legislation through the petition at http://KillC51.ca. This election we will be voting to protect our artistry, our rights, and our freedoms: we will be voting for the repeal of C-51. We hope you will join us in ensuring that all Canadians are no longer subject to the chilling effects of C-51 and targeted by government censorship. We can defend against terrorists in much better ways than this.